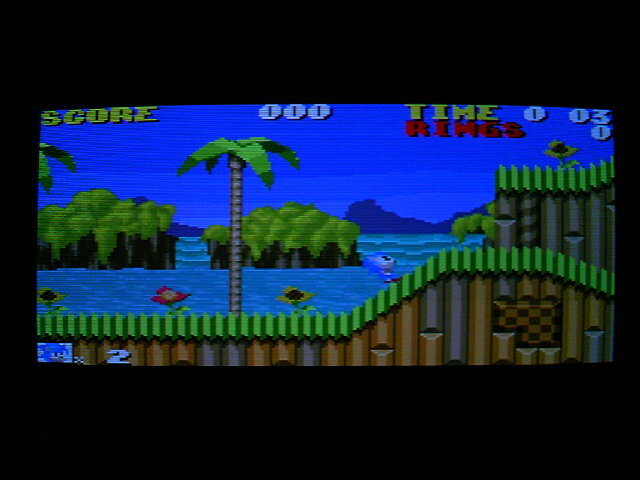 1993 "Sonic" game on Sharp X68k Can we find a dump/image of this? Thanks to Ash the Dragon for retweeting this blog post from 2014. Based on the responses in the Supreme topic of other knowledge, this seems to have remained buried for the last 20 years. The art style seems to pre-empt future retro classic sonic and I like it. I'd like to see the assets ripped from the game but using my advanced google fu (ie simply searching for 'hedgehog' in a X68k rom set) I have yet to find a rom dump/disk image of this game/demo. Do I sense a community project looming to track this down? Wow, nice find Ash & Doc! Really diggin that fake 3D plastic sheen. I doubt I'd be able to help out with that so I'll leave it to the pros! Amazing find! Two decades later and we're still discovering games from Sonic's legacy. This is a precious gem of a find. I rushed to Google (pretty much mirroring what you tried) and failed to find a rom image hosted on the sites that I searched. It looks like this particular rom isn't widely available at the rom sites as say a Genesis rom would be. I tried on one particular site that had over 3K rom images and both "Sonic" and "Hedgehog" were not among the results. Searching more specifically for the rom on Google turned up zero results too. It looks like this might take more effort than searching for the rom image. So where would we begin? EDIT: Searching around a little more I think we may not have the correct name. "Sonic the Hedgehog" for the Sharp x68k brings up zero results anywhere. I tried the developer name "Sakai" but that company must have evaporated in to oblivion or something as there's no record of them either. Something tells me this might be hard to track down. 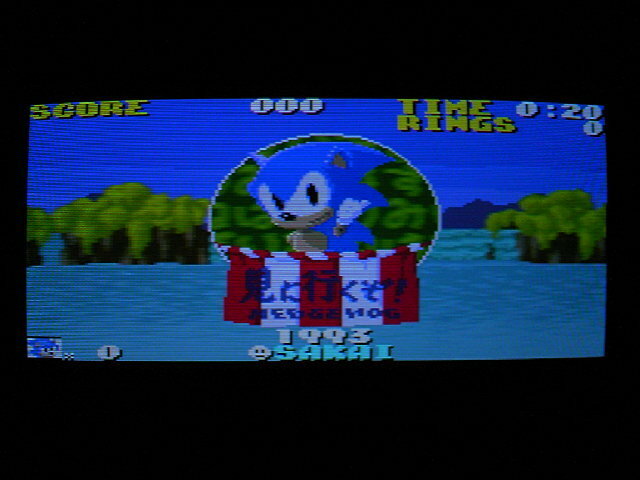 Then again this is Sonic Retro. We can pretty much find anything. I realize that this is kinda stating the obvious, but maybe we'd get more results by "translating" the Japanese (I assume it's Japanese, correct me if I'm wrong) part of the title into Romaji and running that through Google, or a x68k romset? I'd try it myself, but my ability when it comes to translating Japanese is pretty much just Google Translate. The text is "見に行くぞ Hedgehog", which doesn't yield much on Google besides the pages already mentioned. The third page of that ameblog article. Notably the romanization used is "Mi ni Ikuzo! Hedgehog", for future reference. ... not much else to go with. We may just have to ask this blogger, if all else fails. I had a dig yesterday or the day before, and came up with nothing. *Google translate won't do - you have to find the semi-underground X68000 communities of old. That being said, it was similarly difficult to find that Amiga Sonic demo until the realisation was made that it was on the fourth disk in a set of demoscene stuff. But that one ended up being kinda crap - this one looks less so. About the Sharp x68k, I didn't knew this was unknown! Only say it around twitter and retwitted it because it looked interesting. 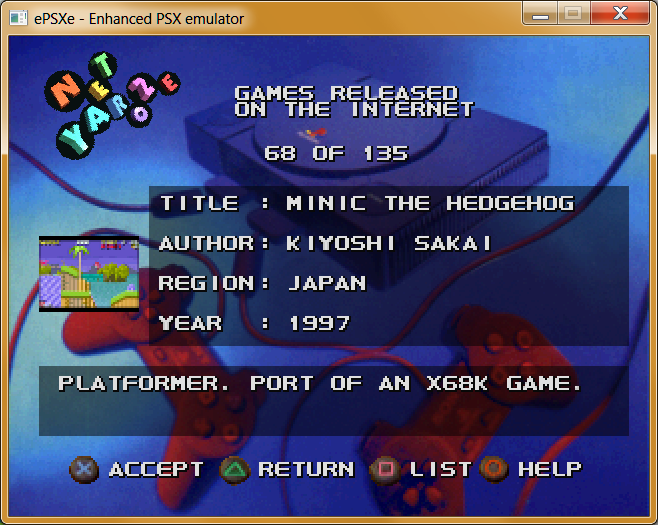 This is a PlayStation executable, so you have to boot this in ePSXe or whatever PS1 emulator you prefer to use. There are differences in this version compared to the X68k version in the blog post, as Sonic is recoloured red, and the title screen is crudely drawn with a copyright date listing both 1993 and 1997, but everything else should be the same. Been poking around in here, found two sets of palette data: one at 0x0F087C containing the red Sonic palette, and one at 0x0F8A9C containing the blue Sonic palette! So crude port and all, we found it then? Pretty much. However, it's not really a "crude" port as it was done by the original author. It's the best we have for now until the X68k original is found. For what it is... Its actually surprisingly decent. o_O It certainly puts SonYc to shame at least. If the author fleshed it out some more I'd say it would have made for a pretty viable fan game. EDIT: Haha... We COULD just stick with "Minic." Its catchy at least.